Sky are currently in the process of upgrading their core network in order to support an expectation of “massive” Video-on-Demand (VoD) growth, which not only stems from Sky’s own TV / IPTV services but also other platforms like Netflix, NOW TV (Sky), Amazon Prime Video and so forth. As part of that Tim Rossiter, Sky’s Core Network Architect (Sky Network Services), has revealed some details about their progress during a meeting of the UK Network Operators’ Forum (UKNOF) and you can access the related slides here. The slides are quite technical and will probably only be of use to those with an interest in the networking field, although they do reveal a few interesting bits of information about Sky’s approach. For example, in 2005 their core network made use of Cisco’s CRS1 routers with a => 640Gb chassis, while today they’re adding Cisco NCS5516 routers that can handle 55Tb per chassis (16 Slots, 3.6Tb per slot). The upgrade is taking place gradually and their Birmingham centre is the first to benefit. By the end of 2019 Sky expects to be handling around 16Tbps+ of total traffic. Elsewhere we also got a short update on the progress of Sky Broadband’s IPv6 deployment to subscribers. 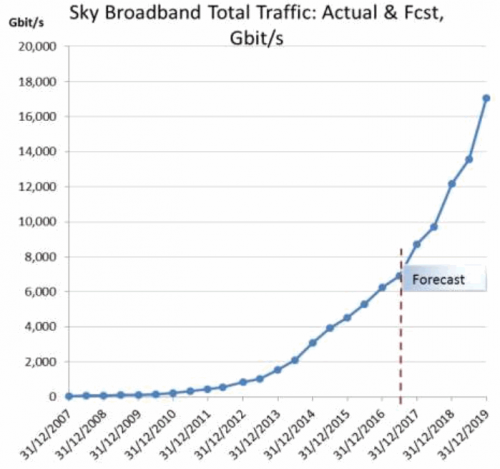 Readers may recall that in 2016 Sky became the first major UK broadband ISP to rollout IPv6 across their network and they’ve recently been followed by BT, while Virgin Media is expected to join them this year and TalkTalk remain eerily quiet on the subject. Sky states that over 5 Million of their customers are now eligible and enabled for IPv6, including all of their Sky Hub routers and their older legacy Sky-supplied Sagem kit. However actual uptake is running slightly behind at over 90%, which the ISP attributes to a combination of some customers choosing to disable IPv6, as well as some issues with the use of third-party or very old routers that may not fully support IPv6. Doesn’t the graph show Gbps rather than Tbps? It does say gbs on graph but the article is correct as 18000 gbs is 8tbps , which makes the article just more understandable instead of putting 18000 gbs . Remove the 1 from 18000 :). Really interesting to see that as a graph. And that is why real fibre is needed to deal with that sort of level of traffic growth. They are saying traffic rate growth will increase. I would agree, on a domestic front, that the loading graphs for our own home FTTC connection are increasing quite significantly. It is a bit of a 1st world issue but Grandad watching footy on the 4k AppleTV, the kids on Disney at 1k, Dad working on his laptop with DropBox syncing everything and then all the incidental downloading and uploading of various iDevices actually gets to quite a large % of an FTTC. It all works on a FTTC – except as I have pointed out elsewhere – the upload limitations are starting to bite and we felt this over Christmas with people uploading videos to sharing platforms like Vimeo etc. Forecast looks correct considering Sky are looking at replacing Satellite with IPTV and G.Fast is coming soon. I don’t think they will replace satellite with IPTV. Satellite can reach every house in the country, where as IPTV can’t. It’s also a lot more reliable. Satellite leasing costs them about £2 million per transponder and they have about 30. That’s about £60 million a year. £6.00 per year per subscriber. A small amount compared to what they charge, and has clear benefits to end users compared to IPTV.